Pickup buyers have expectations when they look for a pickup and the 2014 Chevrolet Silverado exceeds them in a number of key areas. Chevrolet has raised the bar in the fiercely competitive light-duty pickup segment with the all-new Silverado pickup. It has been improved from “hood to hitch” by GM. Todays pickup buyers are not only looking for a truck that is functional and capable to do the job, but they are also looking to save money. The newly-designed Silverado is able to do both. “Silverado’s combination of efficiency and capability will help drivers save money and enjoy conveniences that enhance the overall functionality of the vehicle mile after mile,” said Lloyd Biermann, Silverado marketing manager. 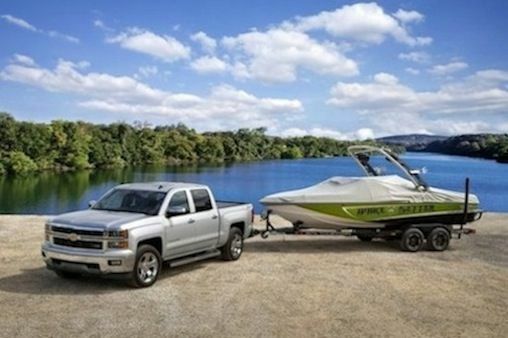 Why is the new Silverado the perfect pickup for summer? Here are 10 reasons why the new Silverado will exceed those expectations when you hit the road this summer for work or play. When you hit the road, stay in touch and on course with Chevrolet MyLink and OnStar. Drivers can choose a destination and get turn-by-turn directions sent directly to Silverado’s color touch screen. The MyLink system includes Bluetooth for phone streaming, two USB ports, an SD card slot and natural voice recognition. The system supports multiple devices for all the passengers to enjoy their own music on those long road trips. The Silverado features a new 110-volt outlet and cord management system that will keep those cell phones charged. There is nothing more frustrating than to need to stay connected and the cell phone battery is dead. The are plenty of storage pockets and compartments to store snacks and drinks for the road. Front and back door panels have integrated pockets that will store drinks, snacks and maps for longer trips. The new EcoTec3 engine family along with improved exterior aerodynamics have helped improve fuel efficiency on the highway. EPA estimates of 23 mpg highway for 2wd models, and 22 mpg highway for 4x4 models with the 5.3-liter V8. Engineers redesigned the cab with close to two inches more legroom in the backseat. Passengers can stretch out and be more comfortable. The rear door are also wider for more ease when getting in and out. Passengers can enjoy a quiet nap thanks to new shear style body mounts that tune out side to side movement for a more comfortable and quiet ride. Triple door seals also combine for less wind noise and turbulence, quieting the interior of the cab. The Silverado now features a new Smart Pickup Box with four built-in upper tie-down hooks to keep cargo items safe and secure. It also has handholds built into the rail protectors, under-rail lighting and an EZ Lift and Lower tailgate. Silverados equipped with the 4.3-liter V-6 will tow up to 7,200 pounds, the highest for any base V-6 in the segment. With the 5.3L V-8, towing ratings go up to 11,500 pounds, more than any light-duty pickup currently on the market. Silverado will be available with segment-exclusive safety features such as Forward Collision Alert, Lane Departure Warning with an Active Safety Seat, and Front and Rear Park Assist. StabiliTrak with Trailer Sway Control and Hill Start Assist are standard on all Silverados. The new 2014 Chevrolet Silverado gets innovative features and upgrades that make it a great choice for pickup customers who will be hitting the road this summer.